Photos above: (left) Parts of the old mines can still be seen in the Mid-Lothian Mines Park, (middle) the village stew shed belonging to the Midlothian Lodge No. 211 Ancient Free and Accepted Masons is used by many churches and civic groups, (right) Crab Louie's Tavern has a long history. Midlothian, Virginia, today is a burgeoning upscale Chesterfield County residential and commercial community situated approximately ten miles west of Richmond on U.S. Route 60 and the Norfolk-Southern Railway. 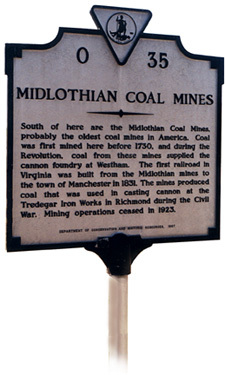 A highway historical marker states that Midlothian is probably the site of the first coal mines in the U.S. Scattered throughout the village are remnants of the Midlothian area mines—old homes, taverns, and buildings of colliery owners and a few dwellings connected with French Huguenots who were among the first European settlers in the Midlothian area. Structures still standing on Old Buckingham Road are Trabue's Tavern, Melrose, Haley Cole's Free School, and the Smith-Vincent house. Fortunately, some natural landscape survives lining the roadside; day lilies, periwinkle, trumpet vines, and Queen Anne's Lace mingle in the shade of tall cedars, hollies, oaks, hickories, and other native trees. The ancient periwinkled oak grove standing sentry over coal miners' graves in Old Mt. Pisgah M.E. Church Cemetery is especially beautiful at the crest of Falling Creek Hill. Also at the crest of Falling Creek Hill on Route 60, stands Railey's Hill, a frame dwelling which once housed the superintendent of the Mid-Lothian Coal Mining Company. North on Salisbury Drive is the 1870 Midlothian Public School now a residence, the 1875 Midlothian Masonic Lodge Hall and Oak Grove, the Norfolk-Southern Railway Crossing, and nearby Etna Hill and reclaimed Etna coal pits. South on Coalfield Road lie the stone ruins of the Grove Shaft of the Wooldridge family Mid-Lothian Coal Mining Company. The Grove Shaft buildings' ruins and park create the focal point of the developing Chesterfield Park. The Midlothian Public Library and the YMCA sports complex adjoin the park property, as does J.B. Watkins Elementary School. 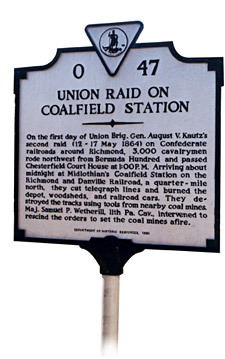 • First recorded coal mines in the United States. 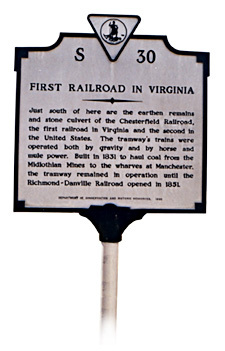 • First railroad in Virginia. • One of the first toll roads in Virginia. • One of the earliest free schools in Chesterfield County. • One of the first Masonic Lodges in Chesterfield County. • Revolutionary War Patriot, Lt. John Trabue. • Oldest African-American Baptist Church in Chesterfield County, Va.
• Confederate Major-General Edward Johnson. • Confederate Major-General Henry Heth. • Wooldridge-Jewett House (Crab Louie's). • Midlothian Volunteer Fire Department. On U.S. Rt. 60 in the village are several landmarks: the c.1870 Jewett-Bass brick store and early post office, the 19th century Jacob Baach house and its towering elm, possibly the only surviving old elm in the village. The rebuilt eighteenth/nineteenth century Wooldridge family home, surrounded by ancient sycamores, currently serves as a restaurant in the center of Sycamore Square Shopping Center. Directly across Rt. 60 in an oak grove stand the sanctuaries and educational buildings of Winfree Memorial Baptist Church, a congregation over 150 years old. The nearby congregations of Midlothian First Baptist Church, formerly Midlothian African Baptist, and Mt. Pisgah Methodist Church date to the 1840s. Other churches located close to the village are Sycamore Presbyterian, Salisbury Presbyterian, Episcopal Church of the Redeemer, Kingdom Hall of Jehovah's Witnesses, and Bethel Baptist Church (formed in 1817). Local Chesterfield County Public Schools include J.B. Watkins Elementary School on Coalfield Rd., Midlothian Middle School on Rt. 60, and Midlothian High School on Charter Colony Drive. The recently expanded Midlothian branch of John Tyler Community College on Charter Colony Parkway provides for the higher educational needs of the diverse populations of western Chesterfield County and the greater region. committees that assisted in projects such as planning, funding, landscaping, preserving, protecting, and maintaining the Midlothian sidewalks and roadside. Members of the Midlothian Garden Club plant and tend the flowers gracing the handsome Rt. 60 stone entryway into the village. Plantings of crepe myrtle, dogwood, daylilies, and various other trees and shrubs delight the traveler's eye, making the drive around Midlothian a memorable treat.